ACTIVITY 138: You are going to hear Robert talking about the conversions he made to his new flat in Buenos Aires. 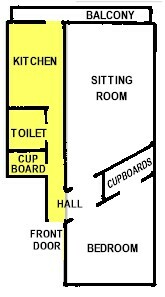 The drawing shows you the first part of his flat conversion. While you listen to his story, fill in the missing words. Then check the correct answers. About a year ago I moved to a new flat. It was much bigger than my old one but somehow I didn't like everything in it and so I set about some major structural . Here's a sketch which should help make clear to you how I converted it to its present state. Originally, when you came in at the front door here, there was a door to the right which led to a very large room, about metres long and four metres wide. Straight ahead of you was -and still is, I haven't done anything with this part of the flat- a with two doors on the left, the first one to the airing cupboard, and the second to the and the toilet together. That's here. Then, beyond that is the door to the kitchen. At the back of the kitchen there's a door which gives on to the balcony here, the whole of the back of the house. It looks out on a beautiful garden, full of tall trees, and whenever I can I have my meals out there. ACTIVITY 139: Now, you are going to hear the second part of Robert's story about the conversions he made to his flat. The drawing shows you the second part of his flat conversion. While you listen to his story, fill in the missing words. Then check the correct answers. Now, the main problem I had with the flat was the room. It was just too big, and I also didn't want to live and sleep in the same space. So I decided to divide it into two separate areas, so that I could have a bedroom. What I did was build two diagonal walls across the room here, the first one starting from where the front door is and going across the room, , to the far wall; and the second to the first, but one and a half metres further back. Are you still with me? Yes? Well, next I made a door at the beginning of each wall, one leading into the bedroom and one into the sitting room. Then I built a wall to the space between the two diagonal walls. Finally, I the original door between the hall and the main room. This helped to make the hall more , as your first impression before was of a dark and very narrow . After this I took a well-earned rest and went on holiday for a week !! ACTIVITY 140: Finally, you are going to hear how Roberto feels about the conversion he made to his new flat in Buenos Aires. The drawing shows you the third part of his conversion. While you listen to his story, fill in the missing words. Then check the correct answers. When I came back, I built cupboards in the between the two diagonal walls, cupboards for each room. And in this way, as you can see, I now had two separate rooms, a bedroom at the front and a sitting room at the back, and each with a more interesting space thanks to the diagonal walls. Also, I've got lots of cupboard space !! I'm really pleased with it. It's not only made my flat more -the separate bedroom and the cupboard space- but also more interesting. I have spaces which give me a sense of adventure, and the visitor never knows what is behind each door. Entretenida forma de practicar vocabulario y arquitectura, no?